Found the recipe for this yummy dish in my local newspaper today. It was submitted by a reader named Bonnie Brines King of Plymouth, Mich. It's the first time I've made pesto from scratch... and it didn't turn out too bad! :) Loved the fresh taste of it. I mixed it with whole wheat penne pasta for an easy dinner. In a food processor, blend the basil, mint, walnuts, orange juice concentrate and garlic until almost smooth. With machine running, gradually add olive oil; process until smooth. 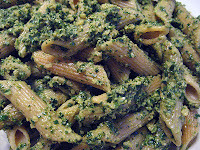 If pesto is dry, mix in more oil by spoonfuls. Press plastic wrap onto surface, cover and refrigerate up to 2 days. Freezes well. I've been wanting to make a dish for Presto Pasta Nights... and this is my first one! Wooo! I do think you've found a better use for the food processor! Thanks for sharing a great dish with Presto Pasta Nights. I have some basil. I would love to try this dish! Give the Gift of Beauty, give a Natural Bath Products and handmade soap Gift.